Endangered shortnose sturgeon have rediscovered habitat in the Penobscot River that had been inaccessible to the species for more than 100 years prior to the removal of the Veazie Dam in 2013. University of Maine researchers confirmed evidence that three female shortnose sturgeon were in the area between Veazie and Orono in mid-October. Researchers had previously implanted the sturgeon with small sound-emitting devices known as acoustic tags to see if they would use the newly accessible parts of the river. Among the most primitive fish to inhabit the Penobscot, sturgeon are often called "living fossils" because they remain similar to their earliest fossil forms. Their long lives—more than 50 years—and bony-plated bodies also make them unique. Historically, shortnose sturgeon and Atlantic sturgeon, a related species also present in the watershed, had spawning populations in the Penobscot River as far upstream as the site of the current Milford dam, and provided an important food and trade source to native peoples and early European settlers. Overharvest and loss of suitable habitat due to dams and pollution led to declines in shortnose sturgeon populations and a listing as endangered under the U.S. Endangered Species Act (ESA) in 1967. In 2012, Gulf of Maine populations of Atlantic sturgeon were listed as threatened under the ESA. Today, a network of sound receivers, which sit on the river bottom along the lower river from Penobscot Bay up to the Milford Dam, detect movement and location of tagged fish. According to Gayle Zydlewski, an associate professor at UMaine's School of Marine Sciences, the three individual fish observed were females. The fish have since been tracked joining other individuals in an area identified as wintering habitat near Brewer. Wintering habitat in other rivers is known to be staging habitat for spawning the following spring. "We know that shortnose sturgeon use the Penobscot River throughout the year, and habitat models indicate suitable habitat for spawning in the area of recent detection upriver of Veazie, although actual spawning has not yet been observed," Zydlewski says. 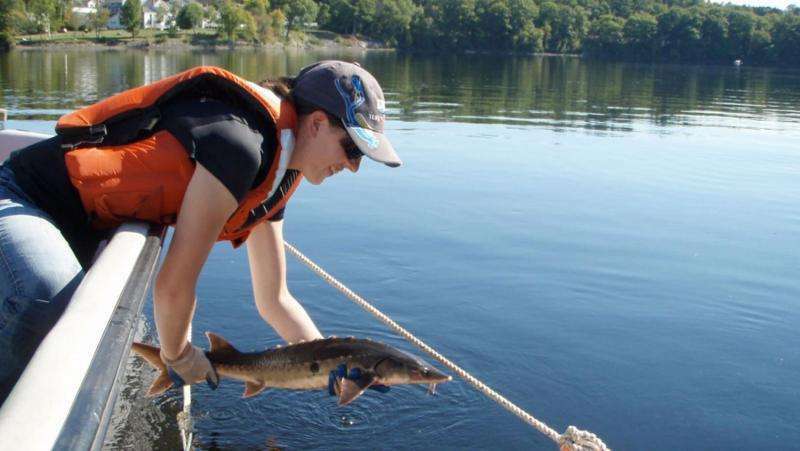 Since 2006, Zydlewski has been working with Michael Kinnison, a professor in UMaine's School of Biology and Ecology; and multiple graduate students, including Catherine Johnston, to better understand the sturgeon populations of the Penobscot River and Gulf of Maine. Johnston, who has been tagging and tracking sturgeon in the Penobscot for two years to study the implications of newly available habitat to shortnose sturgeon, discovered the detections of sturgeon upstream of the Veazie dam remnants. Each new bit of information adds to the current understanding of behavior and habitat preferences of the fish. "We're very excited to see sturgeon moving upstream of where the Veazie Dam once stood, and into their former habitats," says Kim Damon-Randall, assistant regional administrator of the National Oceanic and Atmospheric Administration (NOAA) Fisheries' Protected Resources Division. "We need to do more research to see how they're using it, but it's a tremendous step in the right direction." Habitat access is essential for the recovery of these species. The removal of the Veazie Dam is only a portion of the Penobscot River Restoration Project, which, when combined with the removal of Great Works Dam in 2012, restores 100 percent of historic sturgeon habitat in the Penobscot. In addition to dam removals, construction of a nature-like fish bypass at the Howland Dam in 2015 significantly improves habitat access for the remaining nine species of sea-run fish native to the Penobscot, including Atlantic salmon and river herring. "Scientific research and monitoring of this monumental restoration effort has been ongoing for the past decade," says Molly Payne Wynne, monitoring coordinator for the Penobscot River Restoration Trust. "The collaborative body of research on this project is among the most comprehensive when compared to other river restoration projects across the country." NOAA Fisheries is an active partner and provides funding for this long-term monitoring collaboration that includes the Penobscot River Restoration Trust, The Nature Conservancy and others. These efforts are beginning to shed light on the response of the river to the restoration project. Restoration of the full assemblage of sea-run fish to the Penobscot River will revive not only native fisheries but social, cultural and economic traditions of Maine's largest river.